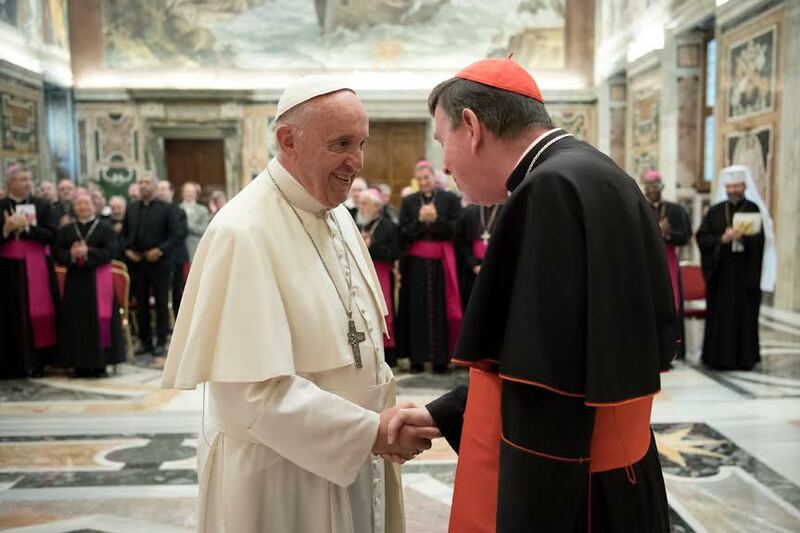 I am pleased to welcome you and I am grateful to Cardinal Koch for the words he has addressed to me. I warmly and sincerely thank all of you, collaborators, members and counselors of the Pontifical Council, because with your daily commitment you help me to offer my ministry as Bishop of Rome as a service of unity and communion, with different modalities and forms, for all believers in Christ. Recently, some meetings with Christians of different traditions have been of great importance and comfort. Praying together with the Heads of Eastern Orthodox and Orthodox Churches in Bari, in communion with those suffering in the beloved and tormented Middle East, reminded us that we can not remain indifferent to the suffering, unfortunately still current, of so many of our brothers and sisters. To join the Christians of various traditions in Geneva, as part of the seventieth anniversary of the Ecumenical Council of Churches, was an opportunity to thank God for the abundant fruits of the ecumenical movement and to renew our irreversible commitment to the promotion of ever greater unity among the believers. Celebrating together with many Pentecostal brothers the 50th anniversary of the Catholic Charismatic Renewal in Rome, at the Circus Maximus, in one of the places where Christians of the first centuries suffered most because of Christ, allowed Catholics and Pentecostals to show their gifts and charisms bestowed by the same Spirit in a symphony of praise to the Lord Jesus, renewing the commitment to fulfill the missionary mandate to the extreme ends of the earth. These were some salient moments of the ecumenical journey that all Christians are called to realize by walking together, praying together and working together, waiting for the Lord to lead us to the recomposition of full unity. And I would also like to add the annual meeting - His Eminence was present at two of them - with the "John 17" group of the United States and the pastors ...: there is a great friendship and familiarity that helps a lot. The theme chosen for your Plenary - "Pentecostals, charismatics and evangelicals: impact on the concept of unity" - is very timely. The constant growth of these new expressions of Christian life is a very significant phenomenon, which can not be overlooked. The concrete forms of the communities inspired by these movements are often linked to the particular geographical, cultural and social context in which they develop, and therefore my brief reflection will not take into account the individual situations, but will refer to the overall phenomenon. First of all, we have the duty to discern and recognize the presence of the Holy Spirit in these communities, trying to build with them the bonds of authentic fraternity. This will be possible by multiplying the opportunities for meeting and overcoming mutual distrust, motivated many times by ignorance or lack of understanding. And I would like to offer you a personal experience and make a mea culpa. When I was [superior] provincial, I had forbidden Jesuits to enter into relationships with these people - with the Catholic Renewal - and I said that more than a prayer meeting it seemed like a "samba school"! Then I apologized, and as a bishop I had a good relationship with them, with Mass in the cathedral ... But it takes a path to understand. Among the various shared activities are prayer, listening to the Word of God, service to the needy, the proclamation of the Gospel, the defense of the dignity of the person and of human life. In a fraternal mutual acquaintance, we Catholics can learn to appreciate the experience of many communities that, often in ways different from those to which we are accustomed, live their faith, praise God and witness to the Gospel of charity. At the same time, they will be helped to overcome prejudices about the Catholic Church and to recognize that in the priceless treasure of tradition, received from the Apostles and kept in the course of history, the Holy Spirit is not at all extinguished or suffocated, but continues to operate effectively. I am aware that, in many cases, relations between Catholics and Pentecostals, charismatics and evangelicals are not easy. The sudden appearance of new communities, linked to the personality of some preachers, strongly contrasts with the ecclesiological principles and experience of the historical Churches and can conceal the danger of being carried away by the emotional waves of the moment or of enclosing the experience of faith. in protected and reassuring environments. The fact that not a few Catholic faithful are attracted to these communities is a source of friction, but can become, for our part, a matter of personal examination and pastoral renewal. In fact, many communities are inspired by these movements and live authentic Christian experiences in contact with the Word of God and in docility to the action of the Spirit, which leads to love, witness and serve. Even these communities, as the Second Vatican Council taught, are by no means devoid of meaning and value in the mystery of salvation (cf. Unitatis redintegratio, 3). Catholics can welcome those riches that, under the guidance of the Spirit, contribute greatly to the fulfillment of the mission of proclaiming the Gospel to the ends of the earth. In fact, the Church grows in fidelity to the Holy Spirit the more she learns not to tame it, but to accept without fear and at the same time with serious discernment its fresh news. The Holy Spirit is always new. Always. And we have to get used to it. It is news that makes us understand things more deeply, with more light, and makes us change so many habits, even disciplinary habits. But He is the Lord of news. Jesus told us that He will teach us; he will remind us of what He has taught us, and then he will teach us. We must be open to this. It is therefore necessary to avoid settling on static and immutable positions, to embrace the risk of venturing into the promotion of unity: with faithful ecclesial obedience and without extinguishing the Spirit (cf. 1 Thess 5:19). It is the Spirit who creates and recreates the newness of Christian life, and it is the Spirit himself who leads everything back to true unity, which is not uniformity. For this openness of heart, the search for communion and careful discernment are the attitudes that should characterize our relationships according to the Spirit. In this, the dialogues carried out by your Pontifical Council with the Pentecostals, with the charismatics and with the evangelicals at the international level, also through initiatives such as the Global Christian Forum, represent a significant contribution and encouragement to develop better relations at the local level. This week I had the joy of having mature ecumenical experiences in the "Marian Land": the ecumenical celebration in the capital of Latvia, then the ecumenical meeting in front of the Madonna's Gate in Vilnius ... These were moments of ecumenical maturity. I had never thought that the ecumenical movement was - in those places - so mature. In the certainty of being able to count on your dedication, as well as on your prayer for me, I renew my gratitude and heartily I give you my Blessing.